Me being a geek isn’t exactly a recent development. Nerddom starts early. I’m pretty sure it happens in the womb. I’ll bet my ultrasound showed me practicing to tie a monkey fist in my umbilical cord. As a result, thought here were plenty of subjects I enjoyed during school, the one that got me all worked up every time it came around was Greek mythology. I ate it up. Imagine my surprise, then, when I found how often people screw it up. Brace yourself while I open up a can of nerdrage. First up, the Cyclops. A cyclops is a primordial giant with one eye in the center of its forehead. Everyone knows that. What everyone also knows is that cyclops means “one-eyed.” What everyone doesn’t know is that they are idiots. It doesn’t mean one eyed! Since when does cycle mean one? That would make a bicycle a “two-one.” No, sir. Cycle means wheel, or circle. So a cyclops is thus “wheel eyed.” As for why they called it that? Who knows. Maybe they were trying to indicate the size. An eye the size of a wheel would be pretty big. Unless it was a small wheel… sort of an opcycle… Or maybe they were describing its shape. That actually makes less sense, since by that logic we ALL have wheel eyes. Probably they thought it looked like a wheel. Sure, it is hard to imagine thinking an eye looks like a wheel, but these are the same people who came up with the constellations. Have you looked at Canis Minor lately? It’s two stars! HOW THE HELL IS THAT A SMALL DOG!? … I’m getting off topic. The point is that when you are saying that a one-eyed thing is cycloptic, you aren’t labeling it as one eyed, you are comparing it to a thing that famously had only one (evidently wheel-like) eye. You’d be better off calling it Sammy Davis Junior-esque. 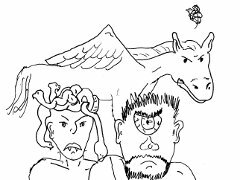 By the way, speaking of Medusa and Pegasus, those are two words that should always be capitalized and never pluralized. There is no such thing as “a medusa”, just like there is no such thing as “a dracula”. Those crazy snaky headed serpent women who turn you to stone if you make direct eye contact aren’t medusas, they’re gorgons. Medusa was just the most famous one. As for Pegasus. Pegasus was a winged horse. There isn’t even a name for the race, because he was the only one… Although technically that would mean that the entire race was indeed called Pegasus… Okay, we’ll let that one slide. But just as all Kleenex are tissues but not all tissues are Kleenex, quit giving Medusa all of this free advertising.